I never managed to get pictures of Tika (was Sophie) to you after we adopted her -- somehow the ones I sent were not openable for you. I have been looking at your successful adoption pictures and stories. I thought you might want to add our happy story also -- I do hope you can open these pictures.We have had Tika almost two years now (adopted 12/22/01). She is FANTASTIC. You had her listed as a border collie/Bernese mix. Everyone agrees on the BC part but I get different opinions on the Bernese bit -- some think she is part German Shepherd. We don't care what bit of Europe she is (Swiss or German) she is a joy to have around. She certainly has border collie energy and intenseness and keeps us on our toes. At first we had some issues with her chasing the two cats but after a few months of house division (I think children gates get more use separating pets!) she learnt not to chase. I never saw an inclination to hurt the cats just chase and, given her BC heritage, likely herd. Anyway she gets on very well with them now. Unfortunately we lost one of the cats over the rainbow bridge not long after we got Tika adapted to them. We adopted a new cat, who I swear thinks she is a dog. Tika and the new cat, Sabah, have been seen sleeping together on the bed and Sabah loves to follow Tika around. In return Tika sometimes follows Sabah around. Obedience training did Tika a world of good -- she was a quick study. Given that I have been unemployed for well over a year Tika has spent a LOT of time hiking with me. I have spent my past two summers and falls in Bar Harbor, ME and we get to hike in Acadia Natl. Park. I think we have hiked EVERY trail on the island at least twice and many of the trails multiple times. My favorite picture of her is of her running hrough the blueberry bushes in the fall. I have enclosed the picture, which I call "Happy Tika". She is just so happy on the trails. She has also got to do a lot of swimming in both fresh water and she will venture into the ocean in protected coves where there is no wave action. She is also an awesome companion for X-country skiing. She is VERY good of leash -- never running out of site but ALWAYS has to be ahead of us! Tika loves to play with her neighbors, a Bernese Mtn dog male and a black lab female. Sometimes an Aussie shows up in our yard also. They all have a great time -- lots of happy barks, fun-growls, and chase and tumble. Despite having neighbor friends she has been an only dog in our household for two years but just last week we adopted a second dog from ACES (a second chance for English setters) so she now has a two year old male companion called Breezi in the family. I hope to get a picture of them both together soon. They are getting on very well but she is the dominant dog. Breezi is quite content to have her do her show off thing -- it doesn't phase him. 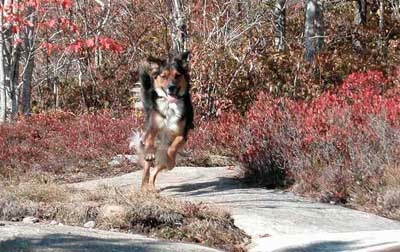 I have enclosed a few of my favorite pictures of Tika - most taken in Acadia Natl Park. 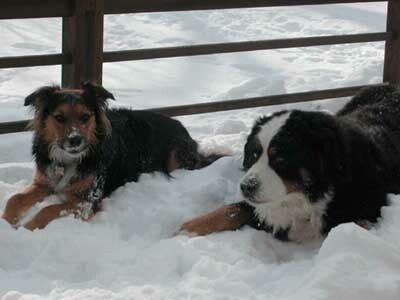 One is a picture of her with her neighbor Bernese Mtn dog, Kinder on our deck in the snow.